"This frame measures 11" x 14" and will fit an 8" x 10" photo if you use the included mat. It comes with hanging hardware"
"This digital frame automatically turns on when it senses someone is in the room and can hold up to 8 GB on its included memory card." "A great value for the money. 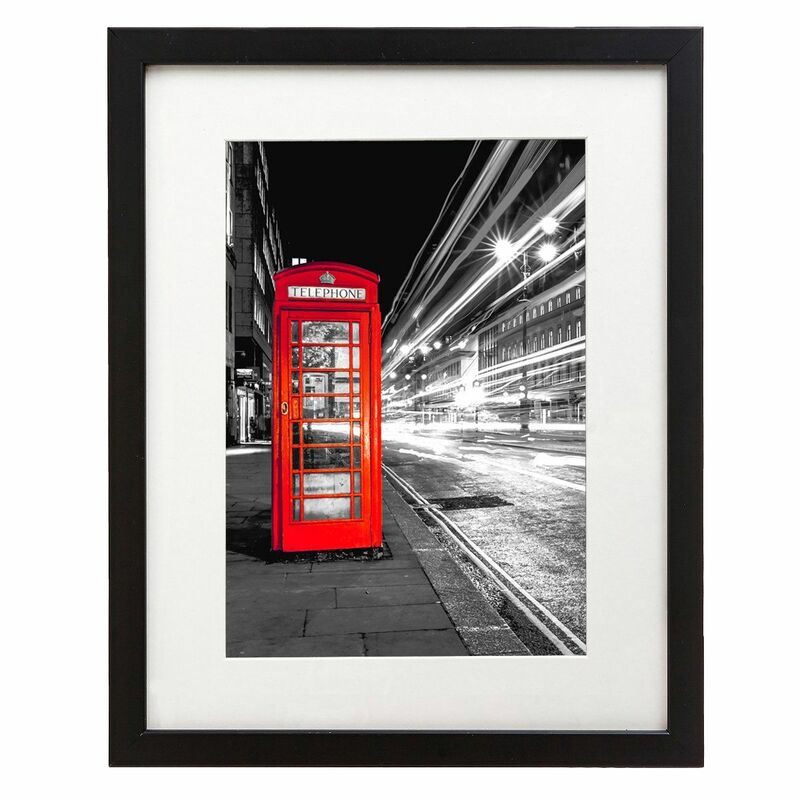 For less than $20, it does the job and looks beautiful on your wall to boot." "Made from 100-percent reclaimed wood, it comes in 13 different sizes ranging from 4 inches by 6 inches to 24 inches by 36 inches." "features a thin, brushed-gold metal frame that’s both subtle and modern. The included acid-free mat adds a professional flair"
"The best part is that you can customize everything to your taste, picking and choosing the frames and mats to fit your unique style." "100-percent customizable, so no two will be quite the same. Choose from one of the seller’s templates or create your own custom text "
"Though they’re incredibly affordable, reviewers are impressed with their high level of quality." They come in five different colors, all of which are classy and subtle enough for even your most special pictures. If you have dreams of building a gallery wall, you'll want a black or white based picture frame that will look seamless when paired with other sized frames. This frame measures 11" x 14" and will fit an 8" x 10" photo if you use the included mat. It comes with hanging hardware to make putting this up on your walls a breeze. For anyone who is scared about hanging the right gallery wall, with this purchase they'll get two e-books that show you how to frame a picture perfectly and how to hang the best gallery wall with suggested layouts. Reviewers are thrilled with their purchase claiming this frame enhances their pictures and doesn't compete with them but still gives you an affordable price. These days, you probably have most of your photos hanging around on the cloud and don't get much chance to see them. The NIX Advance 10 inch Widescreen Digital Photo Frame is the solution to showing off these images in a tech-friendly way. This digital frame automatically turns on when it senses someone in the room, and can hold up to 8 GB on its included memory card. The frame also supports HD video on top of photos and allows you to add external memory when needed. And with the screen's 1280 x 800 resolution, you definitely won’t miss looking at printed photos. If the frame hasn't won over you yet, the company even offers a one-year warranty against defects. Collage frames are a great choice for showing off a collection of photos from your last vacation or your child’s birthday. 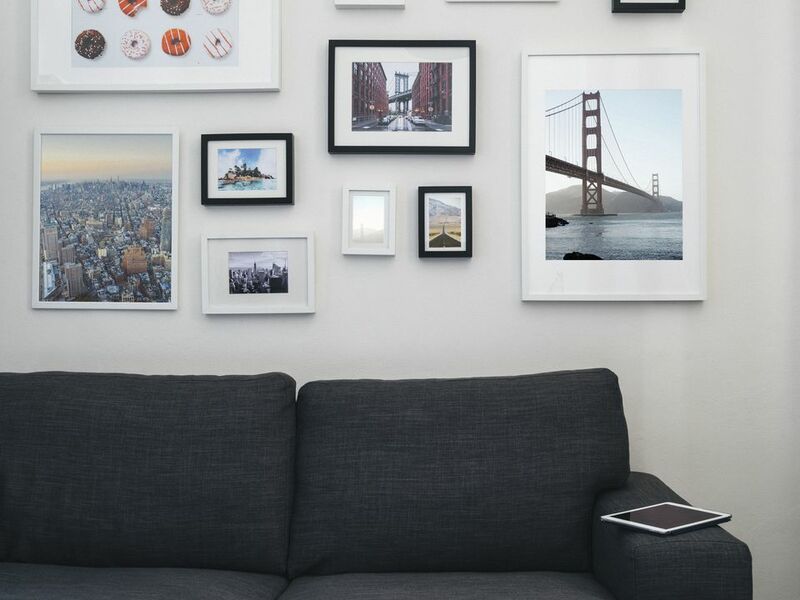 The Americanflat Collage Picture Frame is 11 inches by 14 inches and can display five 4x6 photos. You can hang the frame either portrait-style or landscape-style to fit whatever type of image you want. Do note that this is a wall-only frame and doesn’t include a stand for a table. It’s made from sturdy plastic and glass and comes ready to mount on your wall. Owners agree that the Americanflat frame is a great value for the money. For less than $20, it does the job and looks beautiful on your wall to boot. If you’re looking for a rustic and vintage wooden frame to display those special memories, we love the BarnwoodUSA Rustic Wooden Frame. Made from 100-percent reclaimed wood, it comes in 13 different sizes ranging from 4 inches by 6 inches to 24 inches by 36 inches. The wood is a soft, weathered gray and has pre-mounted hardware for hanging on your wall. It can also be used as a tabletop frame, so you can take it to your office or display it on a bookshelf. The frame includes a Plexiglas cover. The company does note that there may be nail holes or distressed areas because it’s recycled wood, but we think that adds to the overall sense of beauty in imperfection. If you’re on the hunt for something on the chic side, the Project 62 Metal Frame could be just what you’re after. This stunning frame comes in sizes for 5x7, 8x10 and 11x14 photos and features a thin, brushed-gold metal frame that’s both subtle and modern. The included acid-free mat adds a professional flair to the frame as well. You can display it in either landscape or portrait style. Owners say the Project 62 frame is a stunning addition to their home but note that the included hardware for hanging can be a little complicated. Many suggest adding a picture wire to make installation easier. Gallery walls are incredibly popular right now, but accumulating all the frames you need to create one can be a time-consuming chore. Good thing the Gallery Perfect 7 Piece set includes everything you need to assemble an Instagram-worthy gallery wall. This set comes in walnut, black or white and includes high-quality white mats to illuminate your pictures. It includes one 12-inch-by-16-inch frame (for an 8x10 photo with mat), two 8-inch-by-10-inch frames (for a 5x7 with mat) and four 6-inch-by-8-inch frames (for 4x6 photos with mats). The best part is that you can customize everything to your taste, picking and choosing the frames and mats to fit your unique style. Owners love how easy and stress-free hanging a gallery wall is with the Gallery Perfect set. Instructions offer various templates to assemble and customize the wall to your exact needs. Some reviewers note that the quality of the glass covers could be improved, but for the price it’s a great buy. A personalized picture frame makes a great gift for family, friends — or anyone — in your life. The EngraveMyMemories Personalized Picture Frame from Etsy is 100-percent customizable, so no two will be quite the same. Choose from one of the seller’s templates or create your own custom text — there’s no character limit, so it’s totally up to you. Measuring 10 inches by 7.75 inches, the frame works best with 4x6 photos. It's available in black or white as well as a rustic faded-wood look. Customers say these personalized frames make great gifts (particularly for weddings) and add that the seller is a pleasure to work with. Being able to choose from one of 10 fonts is another nice bonus, providing a further level of customization. This Mainstays Linear Rustic Frame Set sold at Walmart comes with six 5x7 frames. The 5x7 picture size is a popular one, and we love how affordable this set is. It has a lovely rustic look and is made from MDF (medium-density fiberboard), though reviewers say it looks like natural wood. Each frame can be displayed vertically or horizontally and either mounted on a wall or set atop a table. They’re a great choice for any space where you want to add a uniform gallery-style look. Owners love how lightweight and easy to hang the Mainstays frames are. Though they’re incredibly affordable, reviewers are impressed with their high level of quality. Weddings, portraits, engagement photos ... Many of life’s most precious pictures are best captured with an 8x10 photo. This Muse Wood Frame set comes with two solid-wood picture frames that are perfect for any special occasion. They come in five different colors, all of which are classy and subtle enough for even your most special pictures. You can hang them either vertically or horizontally, or display them on a desk or table. The frame also includes a 0.25-inch inside border to give it a more elegant feel. If you want a versatile and beautiful frame for your 8x10 pictures, the Muse Wood Frame is a great choice.